White Meat is an ingredient used in Provisioning to make a variety of Food dishes. As a meat-type ingredient, all standard recipes using white meat will have an Increase Maximum Health effect. 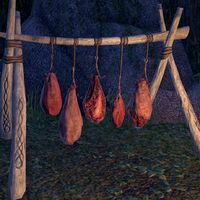 White Meat may be found in containers throughout Tamriel, and may also be found on tables or hanging from hooks or strings in cooking areas or camps. You may also find white meat by killing certain usually passive animals, such as monkeys, pigs or sheep, though many of these animals are domesticated, so killing them may be a Crime. Savory Dishes involve Meat and Fruit, and add an Increase Maximum Magicka effect to the dish. Ragout Dishes involve Meat and Vegetables, and add an Increase Maximum Stamina effect to the dish. This page was last modified on 14 May 2018, at 22:35.